HOUSTON (AP) — Houston is starting to make a habit of 40-point first quarters. "We got a big halftime lead and didn’t play well in the second half," Rockets coach Kevin McHale said. "We came out and really moved the ball. We had it going up and down and just did a nice job of doing what we’ve been talking about doing, which is attacking early, getting inside to Dwight (Howard) and making some nice passes." "I thought we should have really put the foot on the gas," Howard said. "We didn’t. We allowed them to get back into the game, and that is not what we need to do if we want to be a championship team." 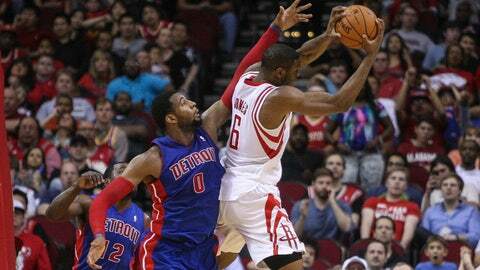 "In the first half, we didn’t play with the energy, enthusiasm or desire you have to play at to play against any NBA team, let alone a high-level team like Houston," Detroit interim coach John Loyer said. "We came in here, and I told our guys we played harder in practice than the first 24 minutes. We had more juice, energy running a three-man weave than we did in the first half. There are two halves to a game, and fortunately, we played a much better second half." "We have enough time to do anything, and we’re four games out, so it comes to what we do as a team," Drummond said. "It can’t be one or two people. We have to be as a collective group to want to buckle down and try to win games." "I think guys stopped playing a little bit because of the lead," Jones said. "We just tried to make sure that we got back to it on the defensive end to make sure we got the win. I think we did that late in the fourth." "We did a good job of coming out with some aggression and getting some defensive stops and getting out in transition," Harden said.